Winner of six Academy Awards, including Best Picture and Best Director, Oliver! remains one of the greatest and grandest movie musicals in cinema history. Updating the Charles Dickens classic via Lionel Bart’s blockbuster West End musical, the timeless tale is told through a series of unforgettable songs and dance set pieces, following 9-year-old runaway orphan Oliver Twist (a fantastic Mark Lester), who becomes ensnared with a gang of young pickpockets on the streets of London. 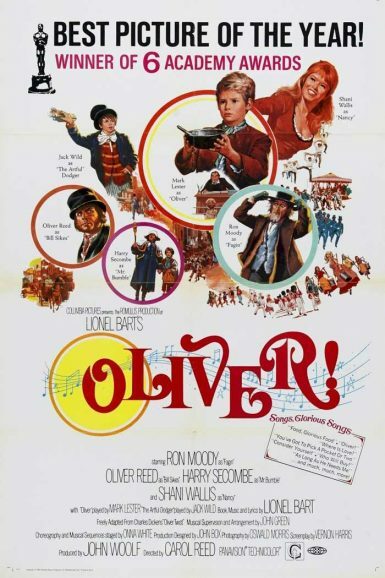 Featuring pitch-perfect supporting performances from Ron Moody, Oliver Reed, Harry Secombe, Jack Wild, and Shani Wallis, Oliver! is best experienced on the big screen!